Andrew Baggarly is the San Francisco Giants beat reporter for the San Jose Mercury News and has been covering baseball for various newspapers for over a decade. He blogs for the Bay Area News Group and has been both a Hall of Fame voter and an official scorer. He lives in Eugene, Oregon. Duane Kuiper is an Emmy award-winning sportscaster for the San Francisco Giants. He lives in Danville, California. The San Francisco Book Review recommends A Band of Misfits. The Edmonton Journal spotlights Royal Romance, Modern Marriage. Mary Boone talks to FoxNews.com Live about Royal Romance, Modern Marriage. MLB.com celebrates the Giants with a feature on A Band of Misfits and Worth the Wait. The San Francisco Chronicle recommends A Band of Misfits. The LA Daily News gives a nice review to A Band of Misfits. The California Report talks to Andrew Baggerly about A Band of Misfits. For 53 years, San Francisco waited. Waited for a team like the 2010 Giants to come along. Waited for a team that could end a title drought that started in New York and carried on for more than five decades after a move to the west coast. Waited for that one magical postseason run that could unleash more than a half-century of pent-up frustration. At long last, the 2010 Giants hopped on that magic carpet and made it happen. 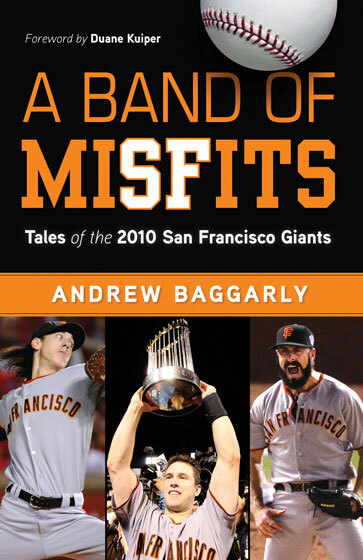 San Jose Mercury News beat reporter Andrew Baggarly captured the 2010 Giants' incredible run through the regular season, playoffs and World Series in his new book, A Band of Misfits: Tales of the 2010 San Francisco Giants, as they finally captured that elusive title not just for the team, but for the entire city of San Francisco. Manager Bruce Bochy, who lovingly referred to his quirky team as his "Dirty Dozen"
Unlike the Giants teams of the previous 52 years that were haunted by a history that always seemed to end in futility, this team - despite overhauling their lineup with waiver-wire pickups like Pat Burrell and Cody Ross -- decided it was time to place its own inimitable stamp on the franchise. Any of the hundreds of thousands who attended the championship parade - the biggest public gathering in San Francisco's civic history - could attest to the fact this band of misfits stirred the soul of an entire region. Andrew Baggarly is the Giants beat reporter for the San Jose Mercury News and has covered the team for the past seven seasons. Prior to that, he covered the Dodgers and Angels beats for newspapers in Southern California beginning in 1996. He writes the popular Extra Baggs blog for Bay Area News Group and can be followed on Twitter @extrabaggs. He has covered a four-home run game, a no-hitter, and multiple World Series and All-Star Games. He is a proud Hall of Fame voter and served as an official scorer for the 2007 All-Star Game at AT&T Park. Baggarly was born in Illinois, graduated from the Medill School of Journalism at Northwestern University, and lives in Eugene, Oregon, during the offseason.